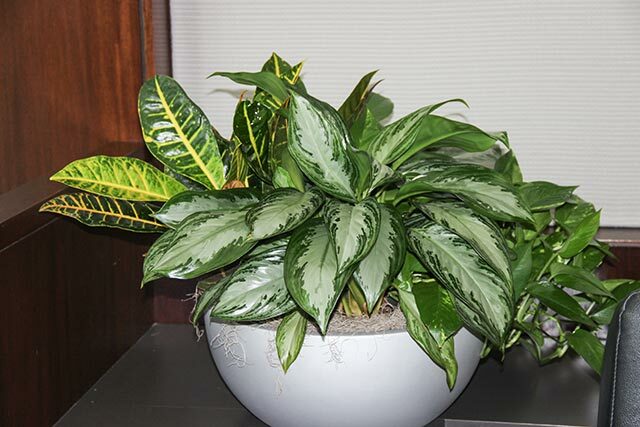 Indoor Plant Maintenance in Houston Area. So you might be thinking what is the big deal anyone can splash a little water on a plant every now and again. While that is true our guaranteed plant maintenance programs involves quite a bit more than that, as we strive to keep your plants in optimum condition based on the ambient conditions of your specific indoor spaces. Plants require different amounts of water depending on the kind of plant, its size, the available light, and soil type. Our plant technicians are trained to check soil moisture on each visit and water accordingly. Due to our soluble salt content in much of our groundwater, some of the plants will tip or burn at the very end of the leaf. Most plants will also shed (or drop) older leaves to make space for newer, fresher leaves. The technicians at Green Thumbs of Texas will make sure that any yellowing or browning leaves are removed or trimmed on each visit. Pruning is also done on various plant species to promote newer growth. Plants, among other things, will collect dust and dirt through the air molecules. The technicians at Green Thumbs of Texas will clean and dust the leaf surface on every visit. This ensures that the leaf surface will remain clean and attractive and that the pores remain dust-free and unclogged. This enables the plant to use its leaf surface at 100% to convert light into energy, (photosynthesis). Fertilization is one of the key ingredients that make our plants thrive in your environment. Our technicians fertilize on a regular basis and are able to recognize fertilizer requirements based on plant/leaf inspections or samplings. Soil analysis can also be done to analyze nutrient deficiencies. On occasion, plants will become attractive to insects or diseases. Our technicians at Green Thumbs of Texas are trained to inspect, identify, and treat any plant with biodegradable indoor EPA-tested/approved chemicals that are safe for indoor use. In some cases, we will replace the plant without treatment if we feel the plant is too far gone. We at Green Thumbs of Texas have one of the strictest quality control measures in the industry. Periodic visits by a manager will ensure that your business or home has the freshest, most vibrant plants from day 1. Once in a while, a plant will not respond to treatment or care and will start to slowly decline or deteriorate. Ask us about our guarantee plant replacement program for more details as well as the terms and restrictions.